chapmaja wrote: I am from Michigan, so I'm not exactly up this location. Looking at the Google maps image it does appear the connection in question is complete. In the discussion it seems people were questioning the direction of travel for trains using this connection. To me it seems pretty simple, based on the discussion being had, and which track is which. The connection appears to be for WB trains to connect to the NKP line. For this to happen, trains using the connection going west on the NKP would be required to use the crossover east of town to get on the "wrong" main, the use the connection to the NKP. Trains going EB to EB would simple use the connection. The question I have is what does this due for the future of the NKP line east of Vermilion? I assume, looking at the maps, the line itself is not in danger of losing traffic. This appears to be more of a move to get higher priority traffic off the NKP and onto a line that can better handled higher priority traffic. 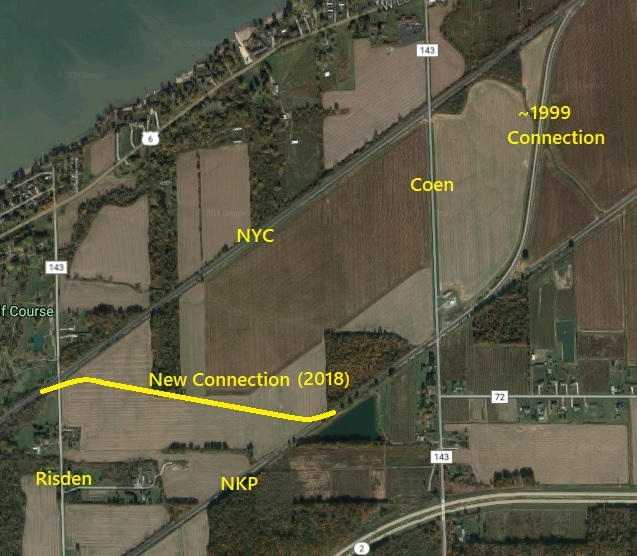 Like DaveO says, the new connection will actually leave WB traffic on the NKP longer (connecting up to the Chicago line west of Vermilion vs. in Cleveland) and add EB traffic onto the NKP via the same connection. The NKP will see an increase in overall traffice from there east to Buffalo as a result. bluestreak81 wrote: Last update on this thread in June was that the EB Chicago onto the EB NKP connector had not yet been connected. Has there been any updates on this connector? I was there today and there is absolutely ZERO progress since June on the connection. bdconrail29 thank you for reporting back on the connector progress. I wonder what the delay is. Curious to see if any progress has been made in the last six months in regards to the EB Chicago onto the EB NKP connector just west of Vermilion. Was there last tues and work was being done, I'd guess "should be" connected within the next week or so. Thanks for the update Fred. A lot of track work, tie replacement, and crossing replacement has been occurring on the NKP line in Lorain and Cuyahoga Counties. I wonder if they're gearing up for an increase in trains with the connector coming online (hopefully) soon. It looks like it will be open very soon after driving by this new connection last Thursday. I'm fascinated to see how much this changes the operations for NS. lakeshoredave wrote: It looks like it will be open very soon after driving by this new connection last Thursday. I'm fascinated to see how much this changes the operations for NS. The trains that go from the Chicago Line to the B Line via the Cloggsville Line and Rockport Yard will now stay on the B Line up to the Vermilion (GC) connection, and there will be a handful less trains through Berea. Right now it looks like 22k/23k and 205/206 will use it so like Cory said you gain those on the NKP to the new connection but lose them on the Chicago Line, to that point. Are the intermodal trains that go to Buffalo and New England running via the new connection yet? If so are these moves made by a long pool crew? Read where the NKP was merged into the NS in 1964. Any reason why this Vermillion connection between the two wasn't made decades ago? The feds want alternate routes for national security reasons, this makes a difference. Also gives alternatives if blockages exist, greater access both E & W. I'll have to get on Google maps and have a look at it. l&mdon wrote: Read where the NKP was merged into the NS in 1964. Any reason why this Vermillion connection between the two wasn't made decades ago? The ConRail takeover by NS in May of 1999 would be the first time both lines would be owned by the same company. Will there be a crossover line run from NKP at Risden Rd. going NE to around Coen Rd. on the NYC? As some of the posts say Google Maps shows nothing so far. Bellevue Guy - my BF was George Danchisen who supported MRLE. Nephew is Jason Green, a baseball coach at Perkins. Great area, was fortunate enough to live in Danbury Twp. until I was 32. Despite some of the weather a lot of people from many areas would like to live in NW Ohio. Advantages to both 2 crossovers NKP to NYC and vice versa allowing both directions can be 1) faster & less cost, 2) alternative routes including for national security, 3) easier to route, and 4 less duplication of some trackage. Can reduce some double trackage including CLE - BUFF probably on NKP. A lot depends on keeping traffic as low as possible through high population areas. There's a real reason for that if you live in one of those areas. A question is will there be a need for train length sidings to schedule use of the Vermillion crossovers? Possibly with electronic train controls that won't be necessary - should know train length and train location at all times. That may be the highest volume of traffic in the US. Being just a railfan and haven't worked for any of the roads this is really interesting. The importance of RR - without them historically it's doubtful the US could have settled the West much beyond the Mississippi, the Erie & Kalamazoo from Toledo to Adrian according to books was the first RR West of the Alleghenies and formed part of the first complete mainline NY - Chi which was necessary for Westward expansion. With transportation and manufacturing N Ohio and S Mich have been and are extremely vital areas of the US. l&mdon wrote: Will there be a crossover line run from NKP at Risden Rd. going NE to around Coen Rd. on the NYC? As some of the posts say Google Maps shows nothing so far.